Just came back from a short vacation to the beach and I've got a bunch of stuff sitting on my desk waiting for me to finish it. Since I've got the week off, I plan on getting as much of it as I can done. That means I'll be working non-stop for the remainder of the week. I should be able to get the few things I have done. And, I need to ship out some models, order some foam and make it to the Thursday Night Old Timer's league. I tried to schedule some posts while I was gone this weekend and I'm spending today catching up on email. So if I haven't replied to a recent email, now you know why. It was nice to come back and despite having a few hundred emails to go through, there were some nice little gems in there. This one comes from Team Snake Eyes and they sent me pics of the painted models that I built for them a while back. It's so cool to see something finished and being used... this guy went to Adepticon and saw plenty of fighting. Hmmm, that is an interesting first comment. Anyways, I am looking forward to the how to paint red post. 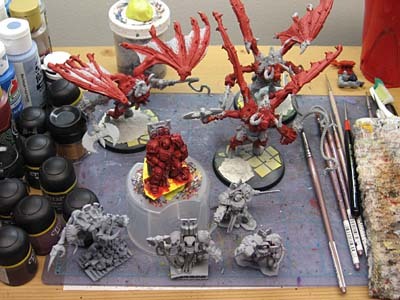 Not only do I have a few Khorne Berzerkers, but I have some Bloodletters and a Bloodthirster sitting around waiting for paint....as is most of my army...where does the time go? Magilla Gurilla: It was supposed to go up yesterday, but I messed that up. I'll post it on Thursday. It's basically how I go through (step by step) and paint the red on the Space Hulk terminators I've been doing. 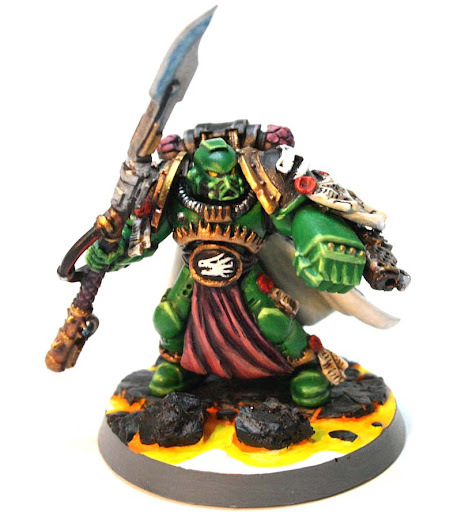 ...and with that you have my attention as I have a few red Space Marines of my own to paint. Love your work btw, Really Awesome Stuff !! !